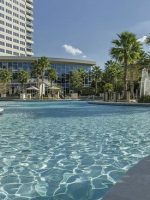 With hundreds of hotels in Orlando, it can be difficult to select the perfect one, but the Hilton brand never disappoints in providing a comfortable and safe place to rest, along with a price that won’t break the bank. 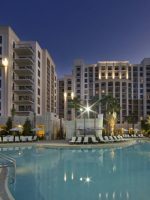 Even better, the Hilton Orlando is a resort hotel, providing more than just rooms for families. 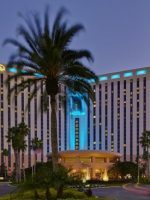 While it is home to many business travelers attending meetings in its convention rooms or at the neighboring Orange County Convention Center, the resort does an excellent job of dividing families and business travelers, and never the twain shall meet — unless business travelers are bringing their families with them to have some fun in the sun! The resort’s large main pool features a water slide and lazy river, and the hotel is minutes away from Orlando’s biggest theme parks and the airport. The combination of amenities makes the Hilton Orlando an ideal choice for families. The resort is still a Hilton, so rooms will be comfortable and simplistic in design. Not all rooms are equipped with bathtubs, and those with tubs are not found in any certain section of the hotel. Be sure to call and request a room with a tub if you have a child who doesn't like showers. Connecting rooms are available for an additional fee. The hotel offers PURE Allergy Friendly Guestrooms for guests with severe allergy issues. Guests can select a unit with double queen beds for a family of four, with room for a small crib. Each guestroom comes with a 37-inch, flat-screen TV, small refrigerator, clock radio with MP3 player, Cuisinart dual-cup coffee maker and Wi-Fi access (included in your nightly resort fee; see "Planning & Tips"). 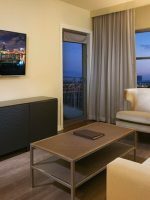 Additionally, one- and two-bedroom suites are available with French doors departing the living room area from the bedroom area. The suites feature a king bed in the bedroom and a sleeper sofa in the living room area. There is a dining table and multiple televisions. 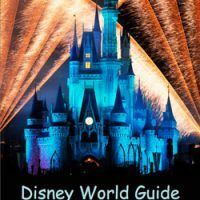 I recently returned from a four day stay at the Hilton Orlando. The hotel was fully booked but did not feel crowded. The pool area is so expansive and well designed that there no difficulty finding a good location, chairs, and shade. Pool restaurant was good but the staff are working hard to cover such a large area. Inside, the hotel has plenty of staff and management who are very accommodating. One night, despite the late hour, the manager lit a fire pit for a group of us and brought us kits for making s’mores. We were allowed to bring bar drinks to the pool area as well. The only negative was the rooms are a bit overdue for a makeover. They are confortable but showing wear. They don’t provide free bottled water but the tap water is drinkable and ice is available. The conference facilities are very good and the staff who provide food services for the events are excellent. I stayed 6 nights, while attending a meeting at the convention center. Check in was very smooth. I arrived early (10:30 am) for an 11:00 meeting and the reservation person was really good, finding me a nice room for a very early check in. The room was spacious and comfortable. As a Hilton Gold member, I am treated to two bottles of free water. I have my two usual complaints at Hiltons- I found the foam mattress not the best (it's OK) , and the towels are quite thin. Other than that the room was great. I did have some noticeable lapses in housekeeping, but I didn't complain. Great shower. The pool and fitness facility is nice; After a long day at meetings I had a short workout in the fitness center and relaxed in the outside whirlpool. The food and drink is very expensive. Cocktails at the bar are about $16-$18. The breakfast place is also expensive. There is a Denny's and Red Lobster close by. Other food and entertainment is on the other end of International Drive, requiring a car. Overall, this Hilton is new, modern and spacious. The resort pool is heated and open year-round, with zero-entry points on both sides, a whirlpool, and a waterslide. Beside it is an 892-foot lazy river with fountains and water cannons. Six cabanas are available for a private, shaded and pampered setting. Cabanas included 37-inch, flat-screen TV's, small refrigerators, a card table and two chairs, two chaise loungers, ceiling fans and privacy curtains. All guests can receive poolside food and beverage service from Tropics Pool Bar & Grill. Hilton Orlando offers a tennis court with equipment rentals, basketball court and volleyball court. A nine-hole putting green are also available with equipment rentals, and the hotel will help schedule golf outings to nearby courses. Equipment is available from 8 a.m. to 11 p.m. 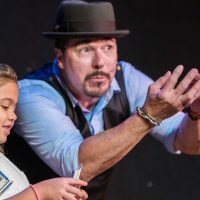 Enjoy daily scheduled activities and entertainment for kids, such as S'mores by the fire pits, free gelato at The Marketplace, glow games, races, putt-putt and horse. Kids 12 and younger can enjoy the resort's spa with mini 30-minute manicures and pedicures. Kids 12 to 17 can enjoy the spa with a parent for a Swedish Massage or Deep Cleansing Facial. All spa treatments must be accompanied by an adult. The resort provides dining at six onsite facilities. Children five years old and younger eat free with a paying adult at select restaurants. Kids menus are available at every restaurant. Spencer's for Steaks and Chops is one of Orlando's 10 best steakhouses, featuring steaks that have been aged for three to four weeks. The restaurant does not come cheap, and young kids may be pressed to find something they like, so save Spencer's for a date night. The restaurant is open for dinner, Tuesday through Saturday. The Bistro is a casual eatery with seasonal, organic and local ingredients from Florida's coasts. Poolside, Tropics Bar & Grill provides snacks, finger foods and cold beverages during the day. Service is provided from 11 a.m. to 10 p.m. The Marketplace provides breakfast, lunch and dinner proudly serving Starbucks Coffee, pastries, salads, sandwiches and grab-and-go items, 24-hours a day. David's Club Bar & Grill is the hotel's gastro pub, open for dinner every night at 4 p.m. and for lunch on Sunday during football season (no joke). The restaurant is casual and features a simple American menu. It's a good bet for dinner with the kids. In-room dining is provided from 5 a.m. to 1 a.m. While the menu for in-room dining is provided with a few selections in your room, you can also order any dish you may have spotted at any of the restaurants at the hotel. The Hilton Orlando has an impressive, central kitchen that cooks all restaurant items, and the staff is happy to accommodate your order. A large, state-of-the-art fitness center provides floor-to-ceiling windowed views of the pool area, with weight training, cardio machines and more. The gym is available 24 hours a day. A quarter-mile outdoor running/walking track is located near the pool. The resort charges a daily resort fee that includes: In-room Wi-Fi, 24/7 access to the fitness center, discounts at specified restaurants and lounges, spa services, retail shops and poolside cabana rentals, as well as recreation equipment rentals. Parking is available at the resort, both self and valet, for a fee. Check with the hotel about its various packages. 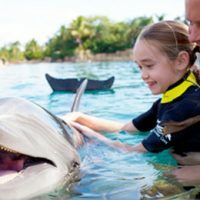 Many include discounted tickets to area theme parks, including SeaWorld Orlando and Universal Orlando. 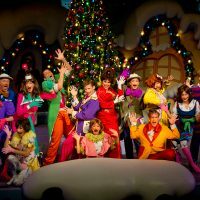 Orlando is a year-round destination, busiest during school vacations and holidays. The resort's peak is during the summer months, with the fall being the best time to visit if you want to feel like you have the resort to yourself. Orlando International Airport is about 15 minutes from the Hilton Orlando, which can arrange for limo service from the hotel. 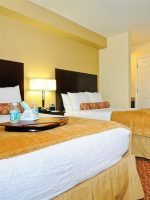 Centrally located on International Drive, where I-4 and Route 528 connect, the resort is three minutes from SeaWorld Orlando and Discovery Cove, seven minutes from Universal Orlando, and 15 minutes from Walt Disney World Theme Parks. A vehicle would be needed when staying here. The spa provides a healthy menu of body therapies and treatments, as well as nail and facial services.